The Mojave Desert Land Trust and the National Park Service are hosting an event on Saturday, 13 November to restore desert habitat in the Joshua Tree National Park. The efforts will help improve the ecosystem around the Nolina Peak, and will be a good opportunity to learn more about our desert resources while giving back. You can learn more about volunteer opportunities on the Land Trust's website, or email Miz Seita at mizseita@gmail.com. Location: Meet approximately 1.5 miles from the corner of La Contenta Road and Covington Flat Road along Covington Flat Road. (Please RSVP and I will email a map and directions). Please bring water, lunch, gloves, sunglasses (eye protection), long sleeve shirt, long pants, sunscreen, wide brim hat, and hiking boots. The California Energy Commission (CEC) gave final approval for Tessera Solar LLC's 663 megawatt Calico Solar power project. Dirty solar at its finest, the facility will be built on 7 square miles of pristine desert on public land, home to endangered desert tortoise, Mojave fringe-toed lizard and a rare plant called white-margined beardtongue. You can read more about the ecological significance of the site on a previous post covering the testimony of desert expert Mr. Jim Andre. Today's groundbreaking ceremony for BrightSource Energy's Ivanpah Solar Energy Generating System is over. 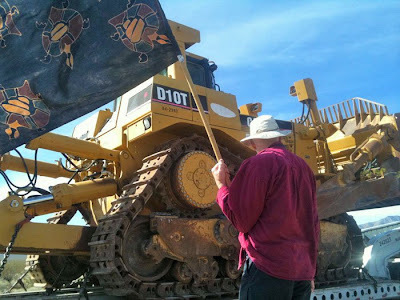 The bulldozers are on site, and the company will begin clearing 5.6 square miles of pristine desert for the massive solar project. It is still early in the construction, but already biologists have had to remove 27 tortoises that were found while clearing the access road. Imagine how many more tortoises we will lose when they begin clearing the rest of the site. The California Energy Commission (CEC) is expected to hear any final opposition to the Calico Solar power project on Thursday, 28 October. Tessera Solar LLC's Calico Solar power project is proposed for over 7 square miles of public land just east of Barstow, California. The project is eligible for American Reinvestment and Recovery Act grants and loan guarantees. The CEC already issued the Presiding Member's Proposed Decision in favor of the project last month, but has to finalize the decision following the end of a 30-day public comment period. The Bureau of Land Management (BLM) approved the 7.2 square mile Calico Solar power project, which will kill or displace at least 22 desert tortoises, and jeopardize the future of a rare desert wildflower called the white margined beardtongue. The California Energy Commission is expected to issue its approval for the project later this month. In other news, construction workers at the Ivanpah Solar Energy Generating System in the northeastern Mojave Desert have found 17 desert tortoises so far. Most of the tortoises will likely lose their homes (burrows) as the crews continue to bulldoze the desert habitat for facility, which will be operated by BrightSource Energy. 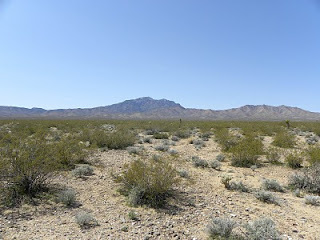 There is a way to cut greenhouse gases and protect the environment, but as many Mojave Desert Blog readers are well aware, utility-scale solar is just another destructive attempt by big energy to earn a profit. Each proposed solar site in California's desert is at least 5 to 6 square miles, and many would be built on pristine desert habitat. The California Energy Commission and Bureau of Land Management are prioritizing these massive and destructive projects without directing them to less ecologically sensitive sites or investing more in rooftop solar. Tell your State and Federal decision makers that you want them to develop a more responsible renewable energy strategy that preserves our public lands and wildlife for future generations. Sign the "Save the Desert Tortoise from Big Energy" petition. The Bureau of Land Management decided that land donated to the Federal Government for conservation purposes by The Wildlands Conservancy could be bulldozed for the Calico Solar power project. The Wildlands Conservancy vocally opposed the proposal to build an energy project on land that it purchased and donated to the American public. The BLM's decision disregards this opposition, and promises from State and Federal leaders--including President Clinton, the Vice President, and the Department of the Interior--that the goodwill of the donation would be honored and the lands preserved for future generations, according to a submission by the Conservancy to the California Energy Commission. 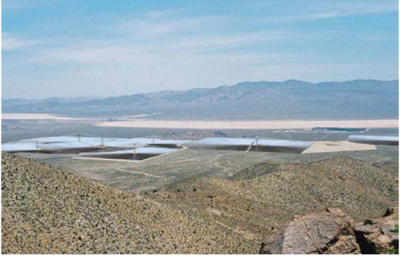 How Many Desert Tortoises at Ivanpah? At least a dozen tortoises have been discovered at the Ivanpah Solar Energy Generating System site already, and the project has only broken ground on an access road. The project, proposed by BrightSource Energy and recently approved by the Bureau of Land Management, will destroy 5.6 square miles of desert habitat for a 370 MW facility. The US Fish and Wildlife Service (USFWS) initially estimated that 32 desert tortoises live on the site and would require translocation from the site. If the construction crews have already encountered nearly half that number when a substantial portion of the project site has not even been touched, the initial USFWS estimates are likely inaccurate. Therefore, the impact of the Ivanpah Solar project may have been improperly assessed in the BLM's and California Energy Commission's environmental reviews. CEC Flaunting Endangered Species Act Obligations? The petition filed by Basin and Range Watch asking the California Energy Commission (CEC) to reconsider its decision on the BrightSource Energy Ivanpah Solar power project raises new information regarding the potential impact of the solar project on the survivability of desert tortoises. The CEC approved the project earlier this month based on the assumption that a translocation plan and mitigation funds could offset the likely loss of endangered desert tortoises. 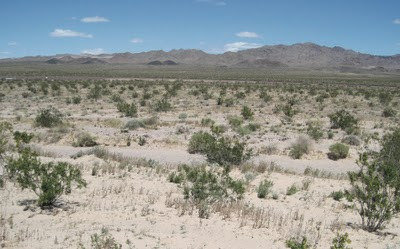 Such mitigation funds were designated for the purchase of land elsewhere in the Mojave Desert to be set aside for tortoise conservation. The California Energy Commission (CEC) announced today that it will consider a petition for reconsideration regarding the Ivanpah Solar Energy Generating System by Basin and Range Watch. If the CEC grants the petition--which it will review at a 26 October meeting--the CEC will have to schedule an additional hearing within 90 days to consider whether or not it needs to change its decision with regard to the Ivanpah project. The CEC approved the Ivanpah project earlier this month, but Basin and Range Watch is arguing that the approval does not give sufficient consideration to the long-term effect the project will have on the health of the desert tortoise population in the Eastern Mojave Desert. 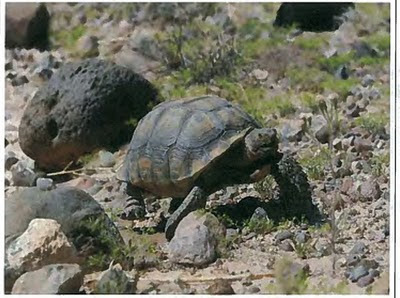 The desert tortoise population found in the Ivanpah Valley is genetically significant, and the project would disrupt a linkage that allows genetic exchange that is important to the species' long-term survival. Tessera Solar LLC's Imperial Valley Solar project was granted final approval by the California Energy Commission (CEC) today. The decision marks an uncertain step forward by the State of California, and pending approval of the Bureau of Land Management, the Federal government, for one of a series of industrial-scale solar projects that will begin to degrade the health of California's desert ecosystems. Imperial Valley itself will consume 6,140 acres of desert habitat in Southern California, which hosts threatened Flat-tailed Horned Lizard, Peninsula Bighorn Sheep foraging area Native American cultural sites of historical significance. The National Parks Conservation Association commissioned a project that gave California high school students cameras, lessons in photography, biology and conservation, and had them photograph desert tortoises in the wild. Tortoises Through the Lens: A Visual Exploration of a Mojave Desert Icon seems to be a great way to educate local students about the natural treasures that exist in the Mojave Desert, and raise awareness about the plight of endangered desert tortoises. The book is full of beautiful photographs of the tortoise, but also other desert landscapes and wildlife. Proceeds from the book benefit tortoise conservation effort. Billed as a progressive project to replace carbon emitting coal plants with solar power, the Ivanpah Solar Energy Generating System (known as Ivanpah SEGS) has been approved by the California Energy Commission and the Bureau of Land Management (BLM). The Ivanpah project is the product of years of false advertising and bureaucratic acrobatics that neglect to admit the true costs of industrial-scale solar energy. 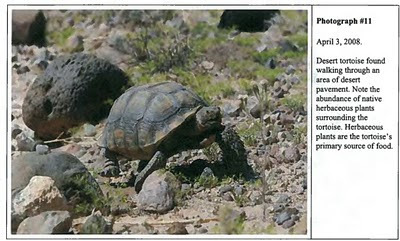 The project likely will displace or kill approximately 30 desert tortoises according to a BLM report, degrade a critical genetic linkage that helps to sustain a healthy desert tortoise population across the Mojave Desert, and destroy thousands of acres of ancient creosote scrub habitat with a high density of rare desert wildflowers. Am I Advocating Sensible Policy or NIMBYism? What are your solutions? It is easy to point out environmental shortcomings of any specific method of producing the energy civilization consumes. It is much harder to come up with viable solutions. Is Utility-Scale Solar Power Actually "Green" Energy? As the Bureau of Land Management (BLM) and the California Energy Commission (CEC) are set to approve several utility-scale solar power projects this year, there is one question energy companies do not want to answer. Can we meet our energy needs with solar energy without destroying as much of the environment as mountain-top coal mining or deep sea oil drilling? California wants to meet 33% of the State's energy needs with renewable energy by the year 2020. According to CEC estimates, energy companies will need to seize nearly 128,000 acres of land in order to produce enough solar energy to meet the 33% requirement. That is equivalent to approximately 200 square miles. The majority of the projects that the BLM and CEC are considering are proposed for pristine desert habitat in the Mojave and Colorado Deserts of Southern California. Many of these proposed sites are on public land.